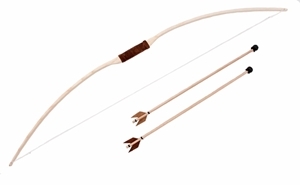 Wooden bow with leather grip and 2 arrows with blunt tips, suitable for kids from 8 years. 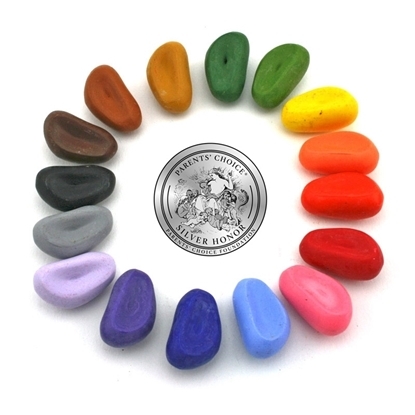 Crayon Rocks are all natural soy wax crayons made from USA grown soybeans and colored with mineral pigments. 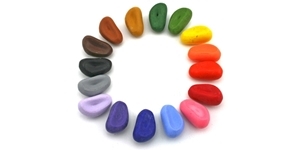 The 16 colors are vibrant and can be layered to make beautifully textured art work. They were designed to strengthen the tripod grip muscles, preparing fingers and hands for handwriting. Their shape allows small fingers to color in large, wide strokes creating pictures rich in color. 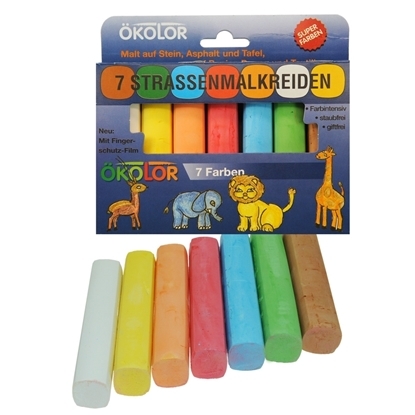 They are used by occupational therapists to develop fine motor skills. Winner of the "Silver Parents Choice award 2014". Big drum about 22.5 cm diam. with 2 sticks. Material wood. Double natural skin covering. Also used as a mini bass drum. Solid tone. 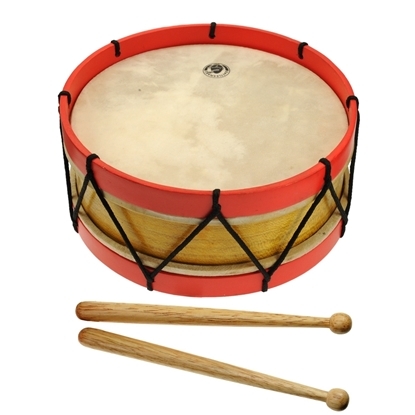 Quality drum made entirely of natural materials with great sound. What's more fun than playing drums! 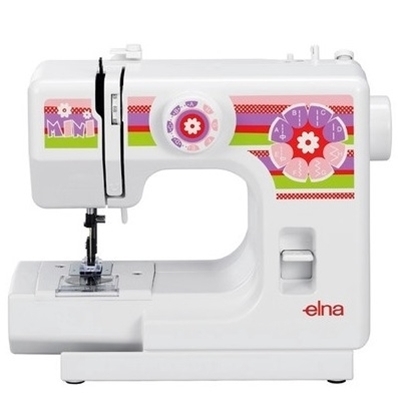 The Elna Nouvelle Mini electric sewing machine is made in Switzerland (Genève) specially for children. It gives children the opportunity to learn to sew and to enjoy the same creative pleasure as their parents. 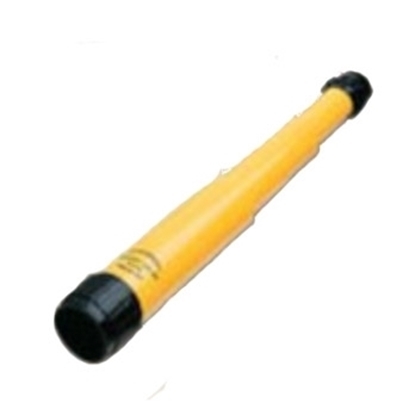 Compact, lightweight and easy to use, it is also very safe through its 6 volt transformer and its lower speed. Provided with easy english manual. 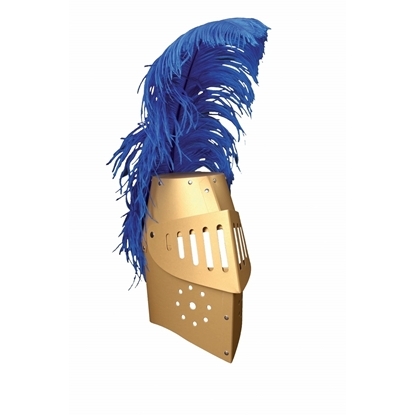 Gold knight helmet, made of cardboard, with colorful ostrich feather and a visor which can be opened or closed. Soft small white rabbit made of wool. 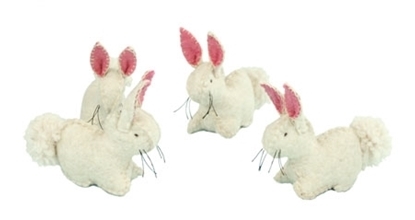 Play with this lovely little rabbits in your play farm and when the night comes put them to sleep in the rabbit hutch. 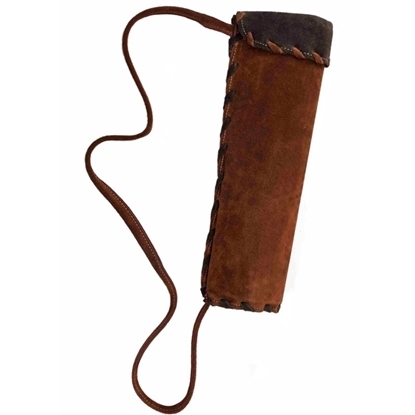 Leather quiver for children, with leather belt to hang on their back, to put their arrows in it, to play Robin Hood or Indians. 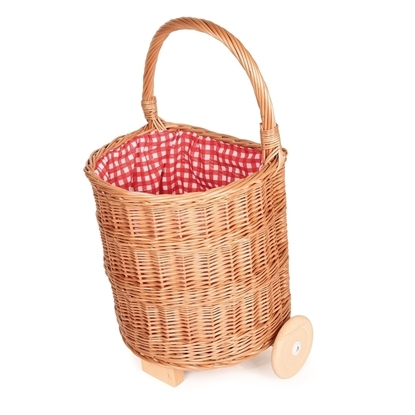 Sewing basket for children, filled with sewing accessories. Includes a plastic compartment, fabric scissors, 12 spools of sewing thread (6 different colors), a measuring tape, a red pin cushion, a set of pins, a set of needles, a metal thimble, a needle threader. 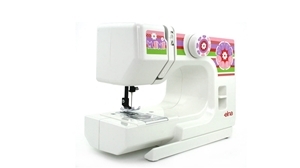 Children will love sewing with mum. Time to learn how to make clothing for the dolls and use our creativity and fantasy. Fun all over! 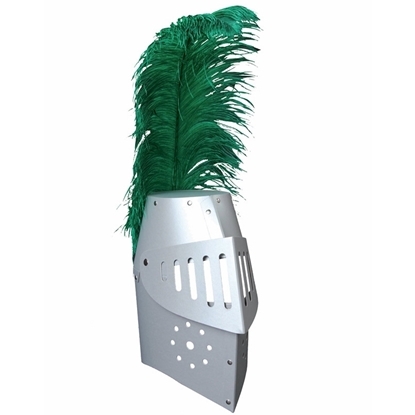 Silver knight helmet, made of cardboard, with colorful ostrich feather and a visor which can be opened or closed. 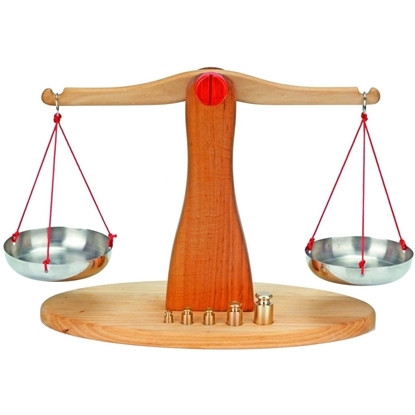 Wooden balance of alder wood with five brass weights. 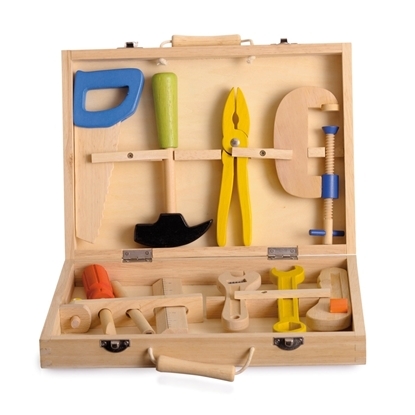 Wooden tool box containing 10 imitation wooden tools with joyful colors, each of which has its own place in the box: saw, hammer, pincers, clamp, screwdriver, carpenter's pencil, ruler, adjustable wrench, combined wrench and stanley knife. Play the carpenter and mimic his gestures by pretending. Cardboard case, white with a red cross, containing medical instruments: a cardboard bowl, a mask, latex gloves, an operation cap, a truly functional metal stethoscope, a wooden thermometer, a transparent plastic syringe and a stick to say A.
Knight helmet black and silver in cardboard, to play knights or templars, little scenes and theatre or for role play and fantasy play. Light brown little rabbit to play farm or to cuddle. 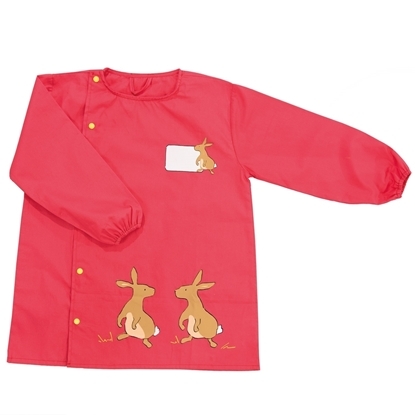 Lovely red school art smock to protect the clothes of enthusiastic little artists. Made of pure cotton and adorned with cute bunnies, closes well to the neck, easy to close with the six yellow push buttons. The sleeves wear an elastic at the ends to protect the clothes well and also not to let them disturb the kid if the apron is still a bit to large. At the heart's location a label print accompanied by a small bunny allows the name of the child to be written. To use at school or for all artistic activity. 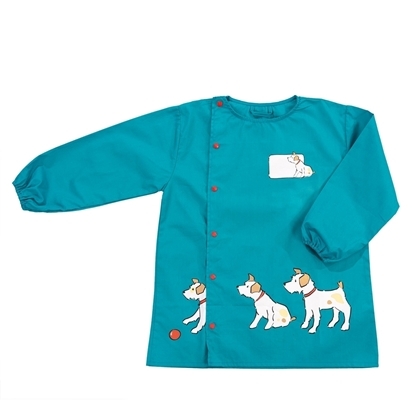 Beautiful and practical school art smock for kids fom 3 to 6 years!! 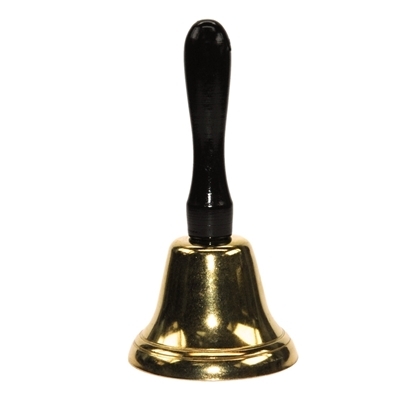 The store bell is ringing. There is a customer in the shop! Let's play market in our small kids shop! 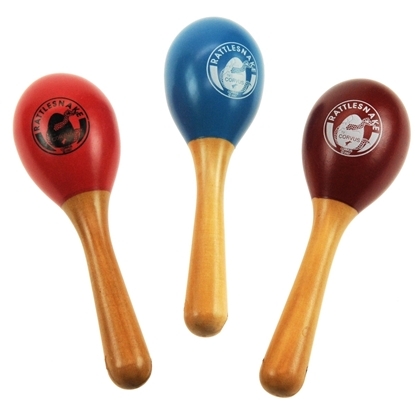 Wooden maracas. Rattlesnake rattle. Material wood. Used as a classic mini-maracas. Fine, discreet sound. Let's perform a concert together with the other kids, playing maracas, drum, tambourine and other instruments. Workbench for children made of oiled solid beech wood, with carpenter's vise made of metal, as well as height-adjustable worktop (ca.10-12 cm). Dimensions: 79x46x60 cm. Working height 60 cm (variable). Very stable (heavy), equipped with all functionalities. 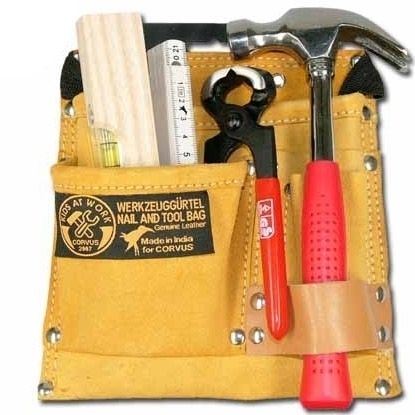 For small carpenters with large projects. 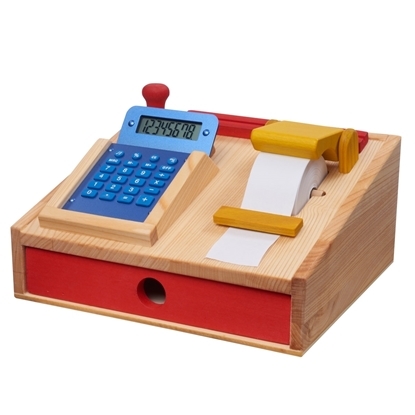 Cash register in solid wood. The drawer can open and close to put the money in it. At the top of the cash register there is an electronic calculator that beeps like in the supermarket when you check the prices. 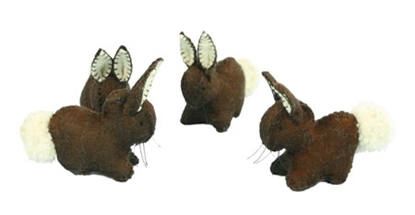 Dark brown little rabbit, made of 100% wool felt. Available in dark brown, light brown and white. Kid's Doctor's outfit, includes a lab coat and a cap. Made of pure cotton. 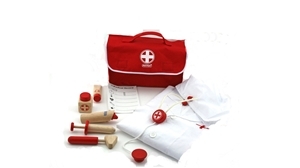 Play doctor or dress up as one with natural materials. Lovely green school art smock to protect the clothes of enthusiastic little artists. Made of pure cotton and adorned with cute dogs, closes well to the neck, easy to close with the six red push buttons. The sleeves wear an elastic at the ends to protect the clothes well and also not to let them disturb the kid if the apron is still a bit to large. At the heart's location a label print accompanied by a small dog allows the name of the child to be written. To use at school or for all artistic activity. Beautiful and practical school art smock! 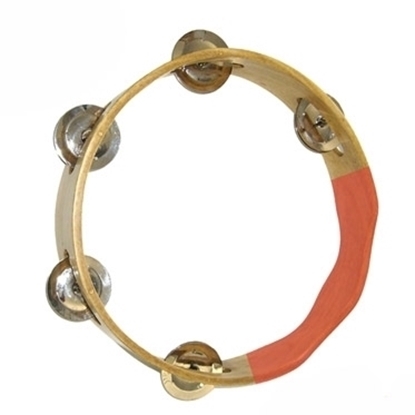 Tambourine with approx. 20.5 cm diameter, 5 jingles. Covered with natural skin. Fine, assertive sound. 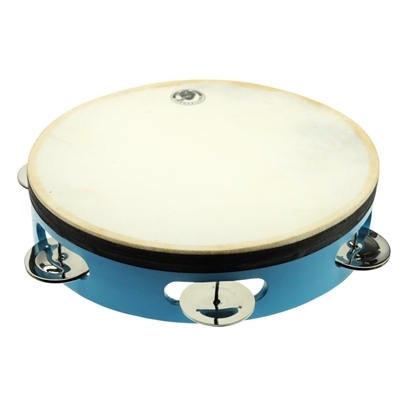 A kid's music instrument which doubles the pleasure thanks to its double function: the ringing of the tambourine bells and the percussion of the tambourine skin. 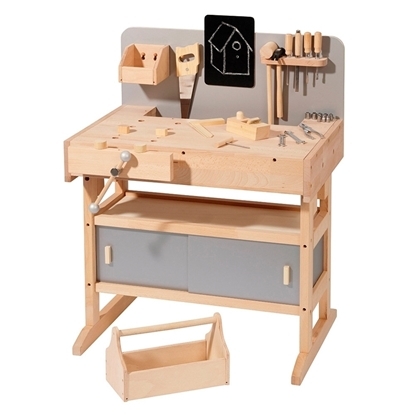 Workbench with 32 tools, specially designed for children, equipped with all functionalities, such as carpenter's vise. Working height 68 cm at top position, adjustable at 4 different heights. At the bottom of the workbench there is a handy closet for storing everything. Xylophone with 8 well-tuned metal plates. Diatonic C major. Valuable toy music instrument. Playing simple melodies from an early age, or inventing new ones! Beautiful sound quality. Education of musical sense and sense of hearing. With two sticks. 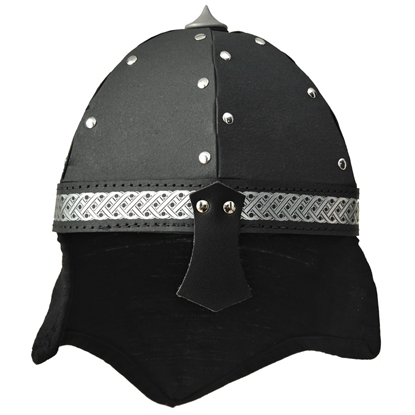 Black knight helmet with genuine leather neck protection for children. This model, worn by the norman knights, is made off glossy strong cardboard, riveted. 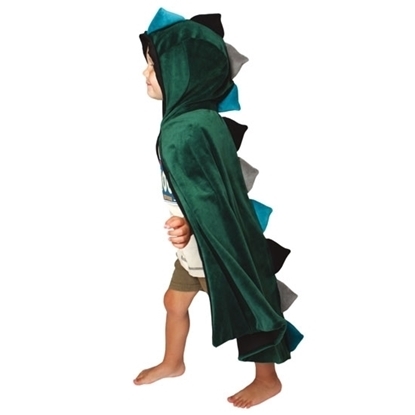 To play knight, little scenes and theatre or for role play and fantasy play. Magnetic board where you can write on and wipe out again, as often as you like. Nurse outfit, comes in two parts: a lab coat and a cap, both in pure cotton. 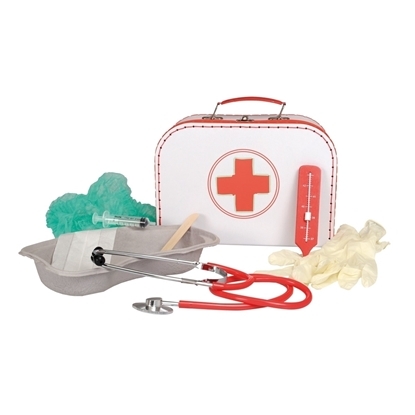 Play nurse or dress up as nurse and take care of the dolls and the plush animals when they are ill.
Set of tools for children with tool belt in strong leather with several compartments. 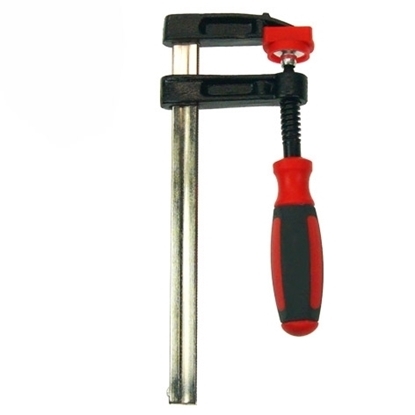 Includes carpenter's hammer, carpenter's pincers, level and folding ruler. 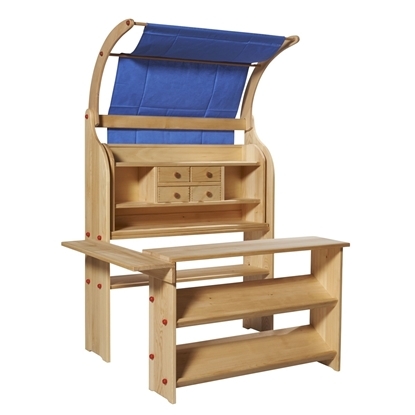 Shop with awning, made of oiled lime wood, consists of a playstand, a 4-drawer rack, a counter, a shelf that connect both for firmness and an arch with blue cloth. 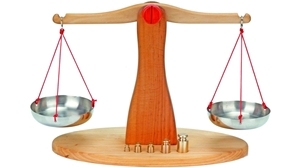 The different parts allow to play a variety of plays, even plays other than playing shop. A toy with lots of play possibilities. 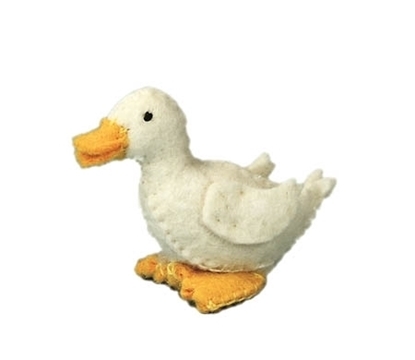 Baby duck, made of 100% wool felt, to play with the other farm animals in the play farm. 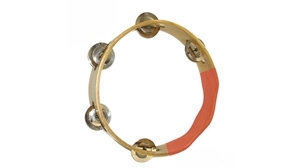 Headless tambourine with 5 jingles. Diameter about 20.5 cm. Great quality. Assertive but fine sound. Essential music instrument in the children's orchestra! Practiced solo, it is also a pleasure! 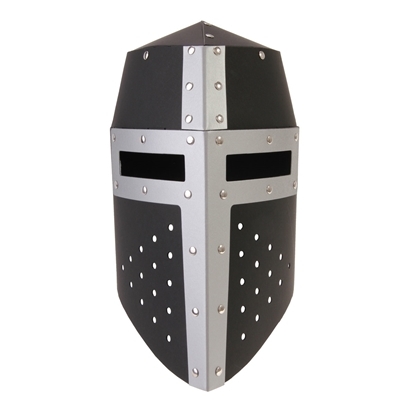 Black knight helmet with linen neck protection for children. This model, worn by the norman knights, is made off glossy strong cardboard, riveted. 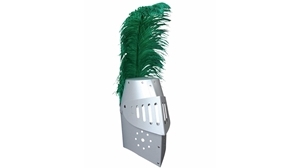 To play knight, little scenes and theatre or for role play and fantasy play. 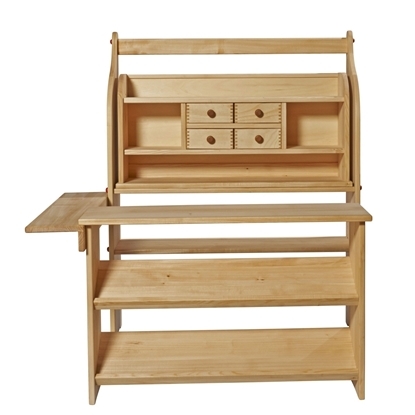 Shop, made of oiled lime wood, consists of a playstand, a 4-drawer rack, a counter and a shelf that connect both for firmness. The different parts allow to play a variety of plays, even plays other than playing shop. A toy with lots of play possibilities. To draw big drawings on the ground, full of colors! Let the free course to your fantasy! 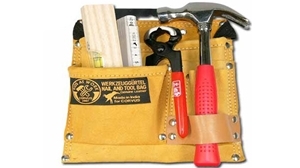 Tool belt and nail bag for children in strong leather with several compartments. Delivered empty, without tools. 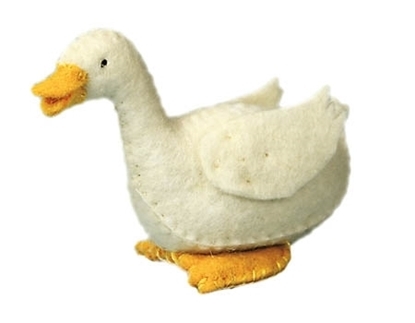 Duck made of felt (100% wool) for your child's play farm! 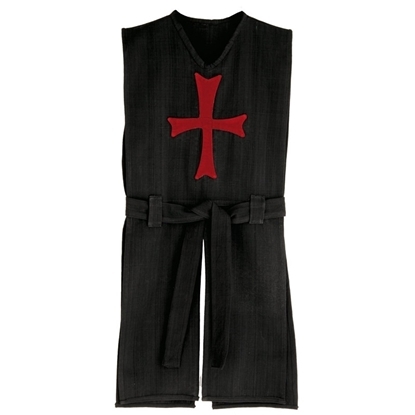 Knight templar tunic, black with red cross application, made of pure cotton. One size from 6 to 12 years. Easy to maintain, durable dress up toy. Set of tools for children. 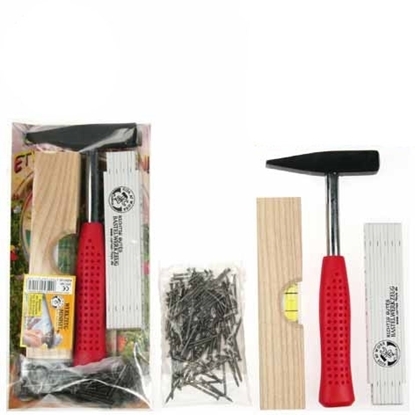 Includes hammer, 100 nails, level and folding ruler. The starter set for the industrious young craftsman. Triangle in solid execution. Fine, silvery sound. 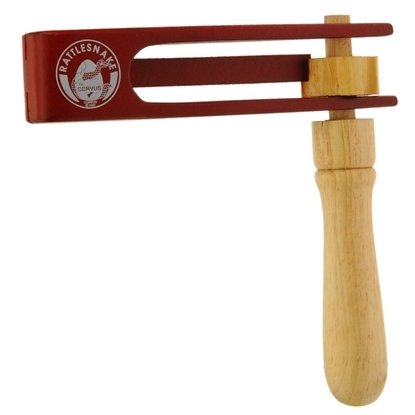 Music instrument that will delight your child with the crystalline sound it produces by simply tapping it with the metal rod. Pull your own trolley behind you to shop with Mum in the supermarket, or playing shop is of course also a possibility. 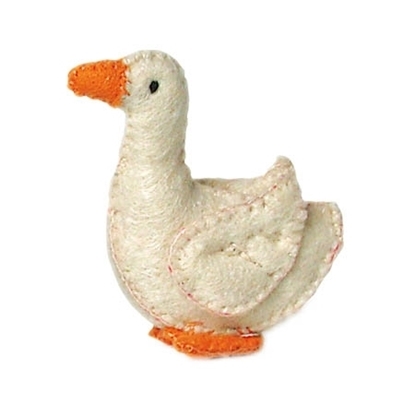 Baby goose made of felt (100% wool). Perfect for your playfarm! 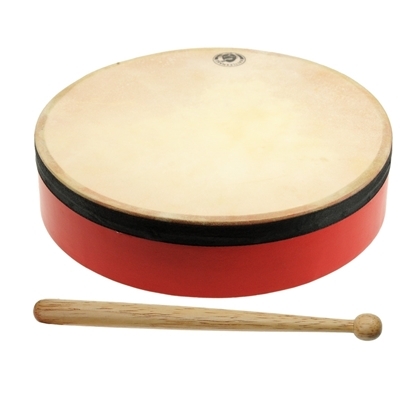 Small hand drum, about 20.5 cm in diameter with one stick. Covered with natural. Fine sound. Gives cadence in the children's orchestra. 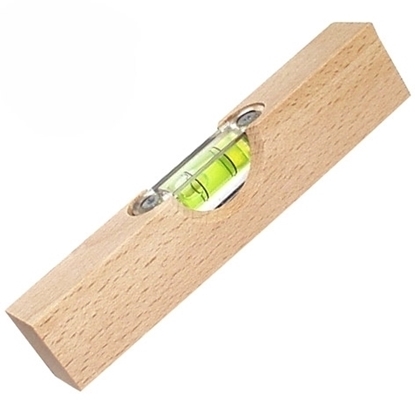 Made of wood, calibrated and functional, useful also when hanging pictures, very educational for kids. For little masons or little carpenters who want to build with an impeccable finish, this wooden level will surely be useful! 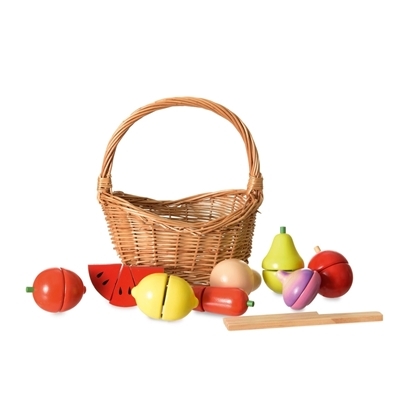 Basket with wooden vegetables and fruit and a wooden knife. You can cut them all in half because the two halves stick through velcro, contains a carrot, tomato, turnip, ognon, apple, pear, lemon and watermelon. Carpenter's pencil. Take measures, annotate them on the wood before sawing and after that put the carpenter's pencil behind your ear. Kids love to mimic grownups. 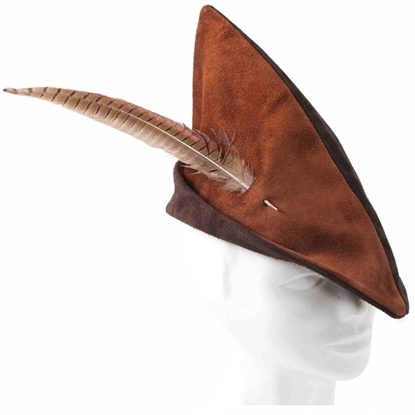 Let's play Robin Hood with this dark brown feather hat. Made of genuine suède leather with brown pheasant feather. 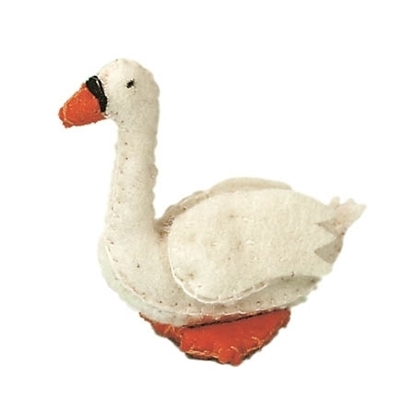 Large goose, made of 100% wool felt, to play with the play farm and the other felt animals. D-pentatonic xylophone with 8 well-tuned metal plates. Valuable toy music instrument. 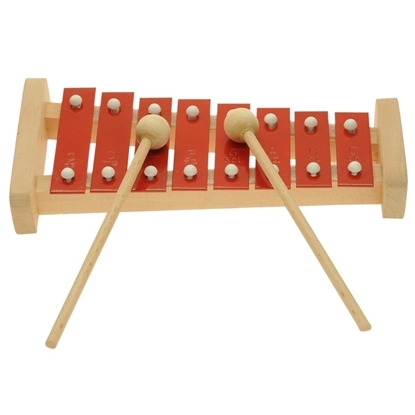 For our little ones: all the melodies generated on this xylophone are harmonious. The pentatonic music is the one perfectly adapted to the life environment of toddlers and preschoolers. 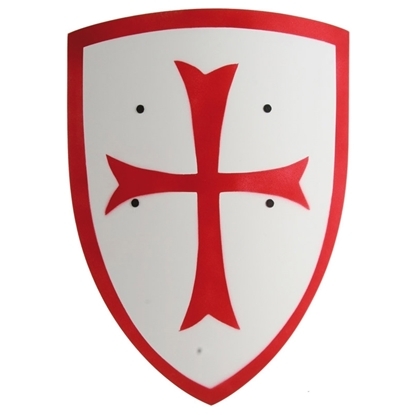 Knight templar shield, white with red cross, made of wood, for kids. 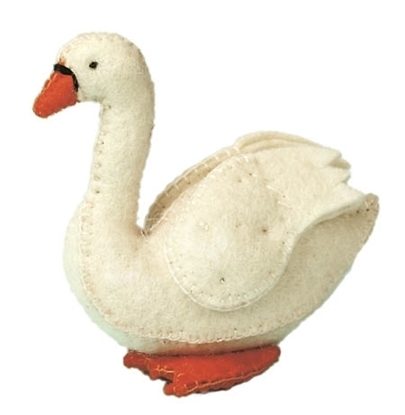 Small swan made of pure wool felt. Perfect for your child's play farm. 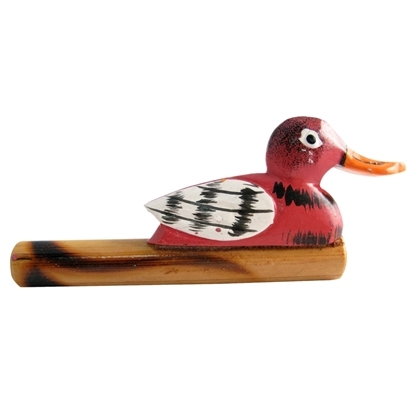 Beautifully sculpted wooden duck whistle. When you blow in it, it sounds like an outraged or nasty laughing wild duck . The hunter man is startled. Very convincing. Play hide and seek, and call each other with the whistle. Maybe ducks will fly over you too! 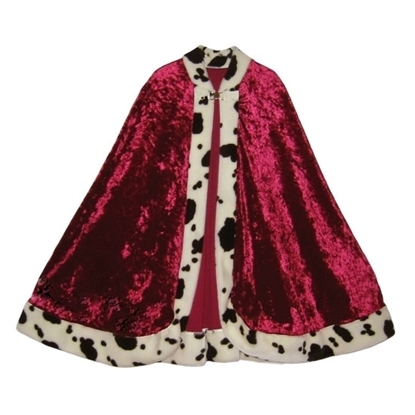 Let your child be the king of the knights in this beautiful king mantle in burgundy red. 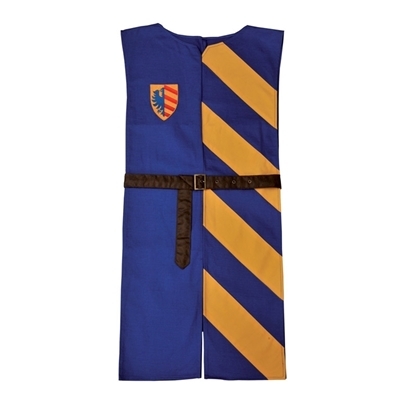 Blue & yellow knight tabard in pure cotton with simili leather belt. One size, fits kids from 6 to 12 years. Don't forget to add a suitable knight helmet, sword and shield for your children's greatest joy. 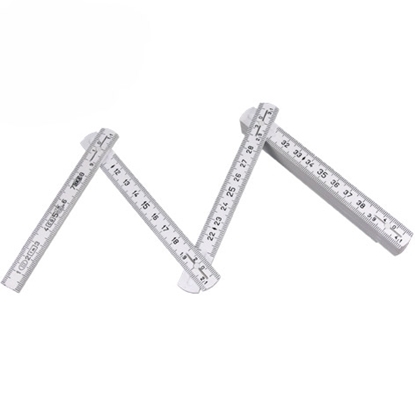 Play meter-ruler for little carpenters with at both sides a genuine metric scale on a length of 1 meter. Kids get a feel for numbers and quantities while playing. 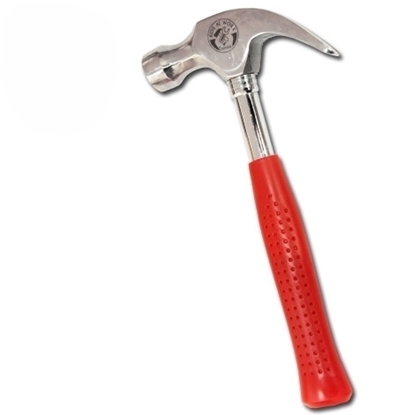 Small tinkering hammer with a little shorter handle, first hammer with a weight of 100gr, optimum leverage for children. Work as a real carpenter! Large swan to swim on your play farm's pond. 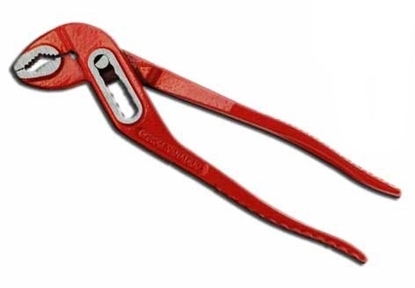 Ratchet with strong but not intrusive sound. Fits well into the overall sound picture of a child symphony. Making noise is the most amusing thing! 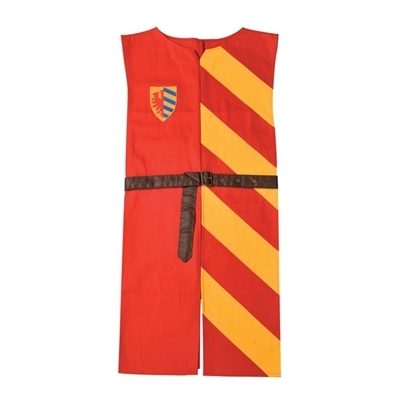 Red-yellow knight tabard in pure cotton with simili leather belt. One size, fits kids from 6 to 12 years. 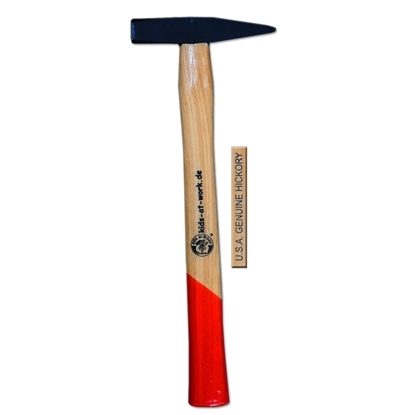 A handy 100gr hammer, a bit shorter than normal (about 21 cm). 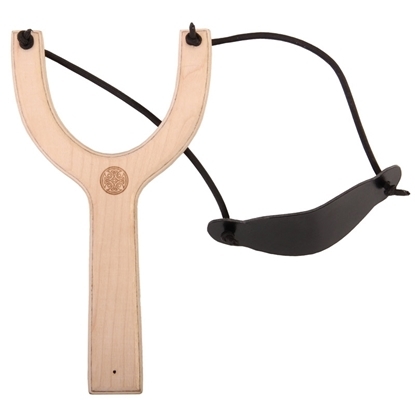 With a handle made of real hickory wood, it fits perfectly in the hand, trains hand-eyes coordination! 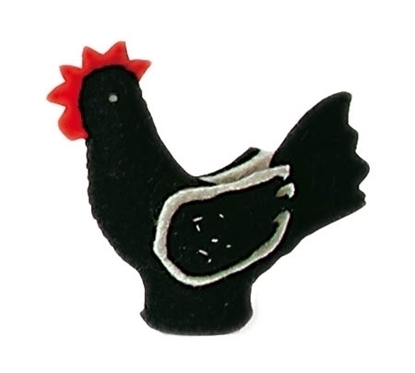 Black hen made of pure wool felt, to play farm with the other farm animals. Playing farm with natural and ecological materials. 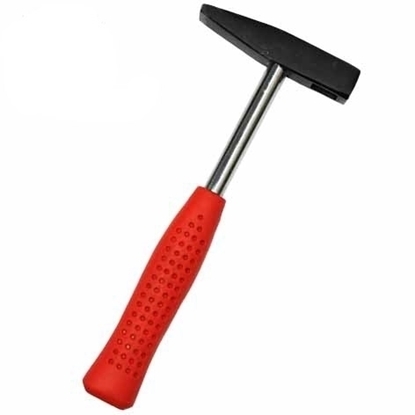 Knock the nails deep and straight into the wood or in the wall and if it doesn't go straight, then easily pull it out with the split head of the hammer. Two seizes: 4 ounces (113,40 gr) and 8 ounces (226,80 gr). Optimum leverage for children. Wooden knight sword for kids, 66 cm long. The handle is painted in gold, the blade in silver. 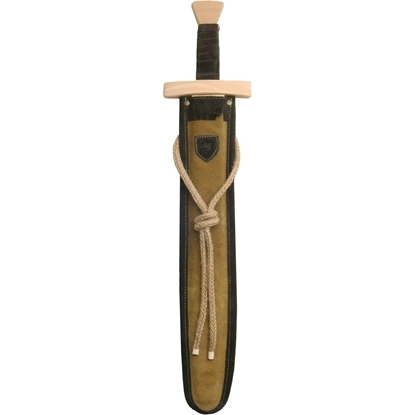 The sword's handle is wond by a white strap of pure cotton to ensure a better grip. Let's pretend play with our fellow knights! Small, handy cordless screwdriver for kids with lithium-ion technology. With right-left rotation, works 3-5 hours, 4,8 Volt, state of charge indicator. Accessories: 10 different screw bits of carbon steel, lithium battery and electrical charger. Work like a real craftsman. 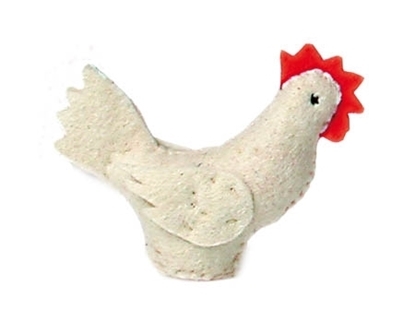 Hen made of felt (100% wool), available in white, black and brown. Perfect for your child's playfarm! 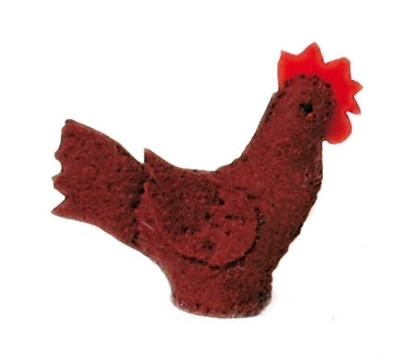 Brown hen, made of pure wool felt, for your kids play farm, durable, ecological and natural. Mechanical hand drill for children in professional quality, driven by circular movement of the hand on the wheel, works really. Drills can be accommodated in the handle. Uses drill bits with diameters up to 8mm. Drill bits are not included, but can be purchased separately in our shop. Teach your child how to drill safely. Energy-saving and power supply independent! 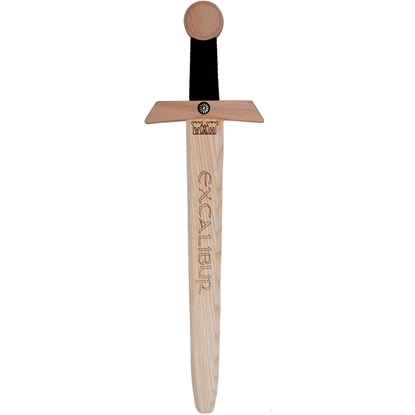 Wooden sword 'Excalibur', 50cm, to play with Arthur, Lancelot and the knights of the Round Table. 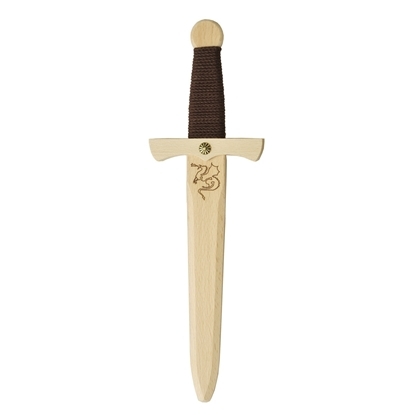 Each child will feel as a heroïc knight with this famous sword in his hands. 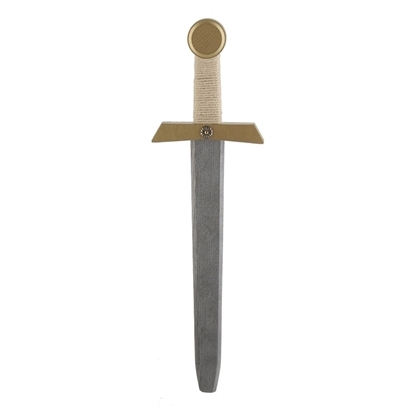 Wooden two-handed sword 'Excalibur' with leather back belt, 102cm, to play with Arthur, Lancelot and the knights of the Round Table. 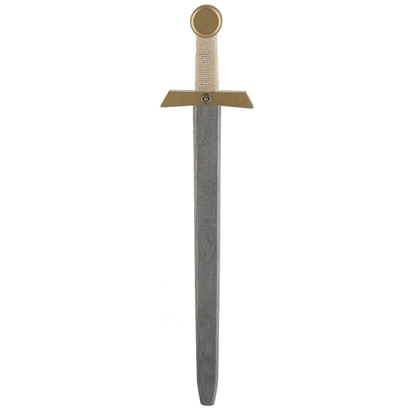 Each child will feel as a heroïc knight with this huge and famous sword in his hands. 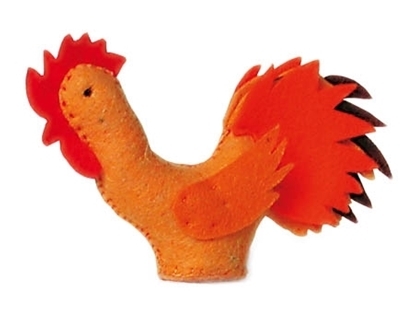 Coloured rooster, made of pure wool felt. 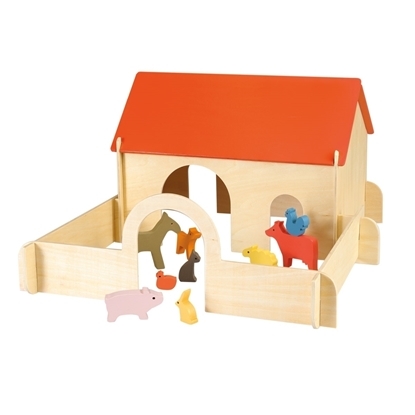 Let your child play with this durable and ecological farm animals. 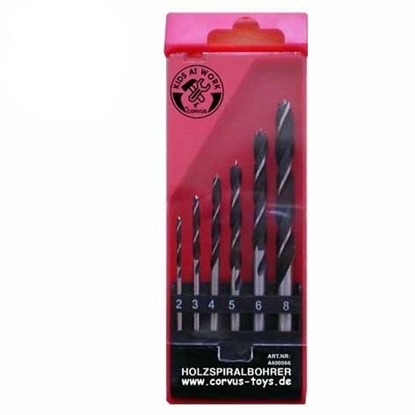 Set of 6 drill bits for wood, 2, 3, 4, 5, 6 and 8mm. Really working, to use with the hand drill for children. 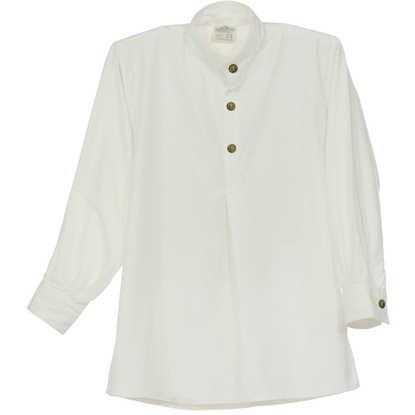 Knight shirt in white cotton for children, to wear under the tabard or under other medieval clothing, for role play or theater. Comes in 3 sizes. 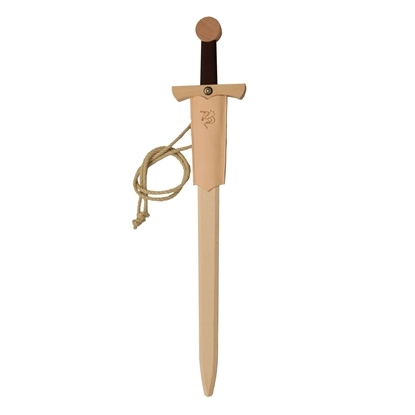 Wooden knight sword for children, with white linen and brown leather scabbard, to play with the other knights. 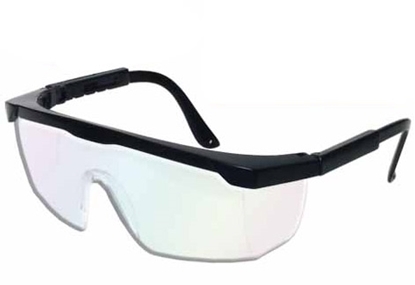 Very good safety glasses for children with adjustable arms, can be adapted to almost any child size. This children's safety goggles protect kid's eyes while tinkering. 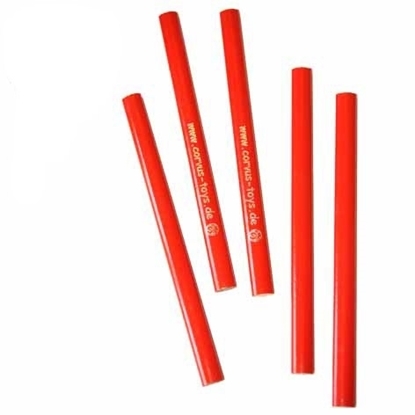 A good eye protection is provided by this toy safety glasses with side protection as well. 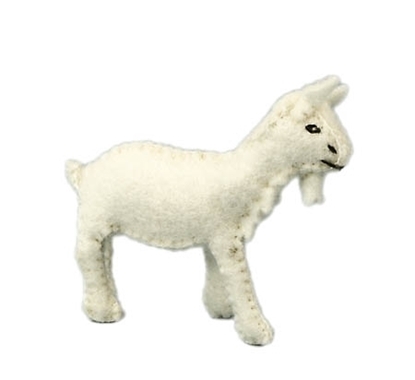 Small white goat, made of pure wool felt, to play farm with the other farm animals and feel the natural materials. 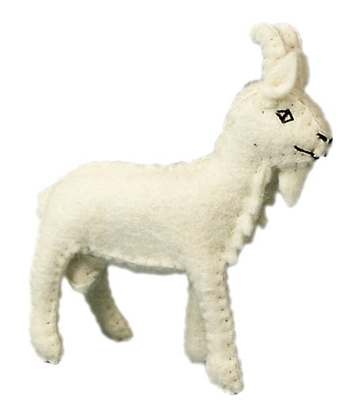 Billy-goat made of wool felt, to play farm with natural materials. 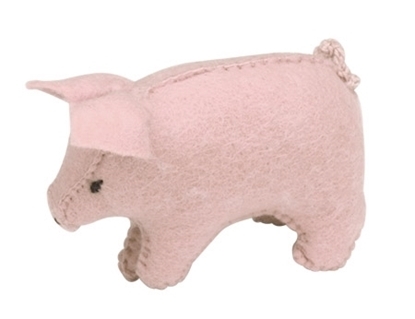 Add the other farm animals to your collection: sheep, goat, pig, horses, donkey and poultry. A real foxtail saw, 350 mm long, with which it is easy to saw. 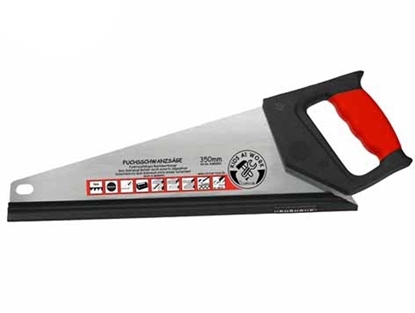 Allows children to easily deliver proper sawing work. 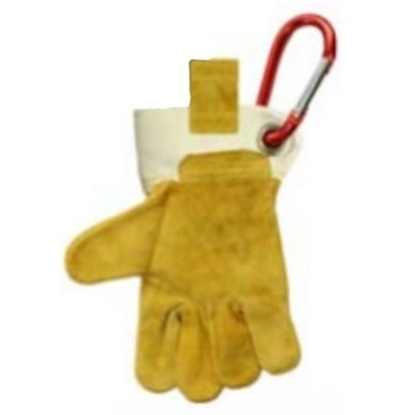 We recommend the use of our safety gloves to protect hands while sawing and to work under adult supervision. German workmanship: Made in Germany. Wooden knight sword for children, with dark brown leather scabbard, to play with the other knights. 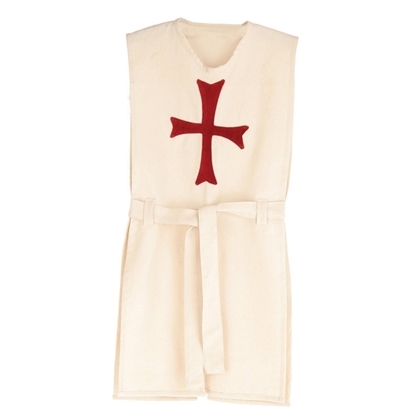 Short knight tabard handmade of suede leather and linen, with metal eyelets and adjustable leather lacing at the shoulders and sides. 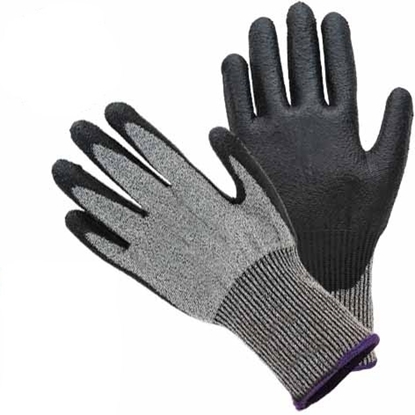 Gray cut-resistant gloves for children with black PU coating on palm and fingertips. Highest cut protection. Protect children's hands from cuts while sawing or cutting! 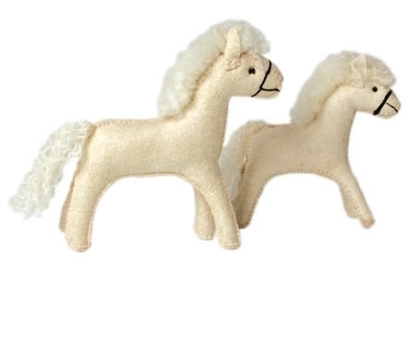 White horse made of pure wool felt, is also available in auburn and dark braun color. To play farm or horse riding. Comes in two sizes, a smaller one and a larger one. That allows to play mare and her filly. 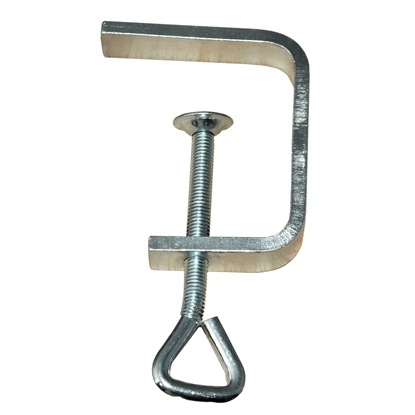 Really working and efficient carpenter's pincers for children. Remove any nail that went wrong from the board or the wall. 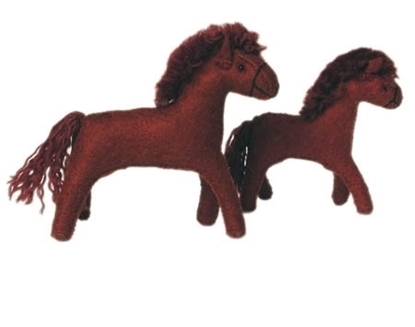 Auburn horse made of pure wool felt, is also available in white and dark braun color. To play farm or horse riding. Comes in two sizes, a smaller one and a larger one. That allows to play mare and her filly. 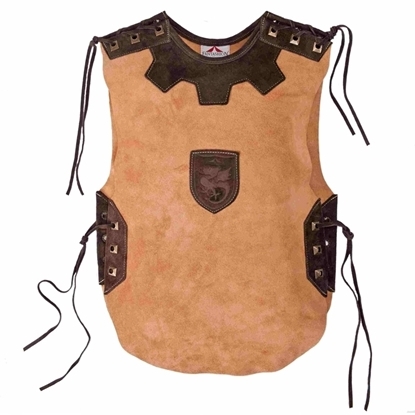 Short knight tabard, very authentic looking riveted tunic, made of aprox. 750 parts, handmade of suede leather with metal eyelets and adjustable leather lacing at the waist. 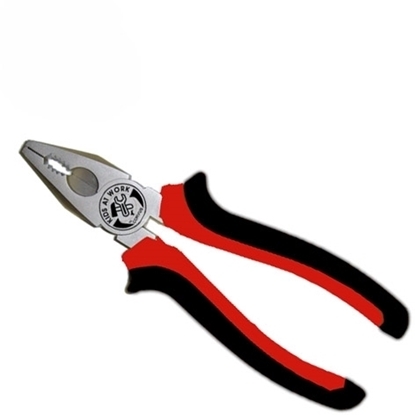 Water pump pliers for children, really working tool. Kids love to work as genuine craftsmen and to mimic grownups. Learn the tricks of the craft! 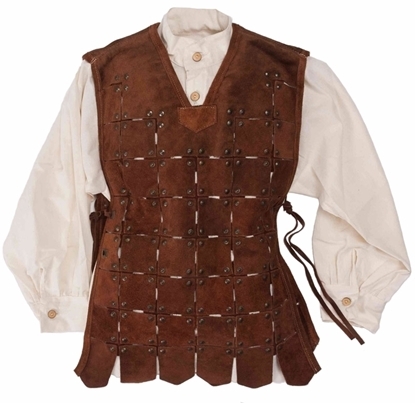 Short knight tabard handmade of suede leather with metal eyelets adjustable and leather lacing at the shoulders and sides. Very strong suede leather, tanned using Anilin leather colouring without AZO or PCB's. 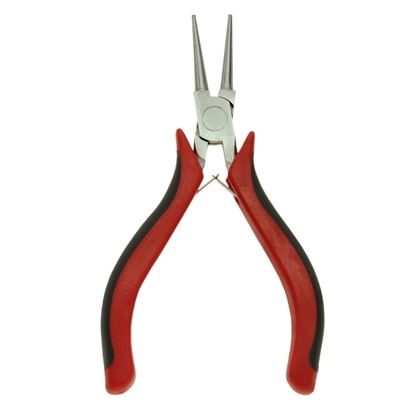 Locking pliers for children, really working tool. 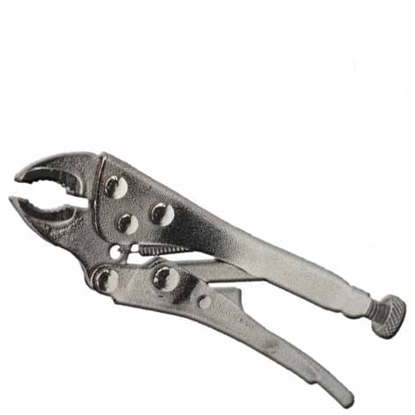 The grip plier is set with an adjusting screw to an certain opening width an locked by closing the plier so that the workpiece is held firmly. Let your kids work as genuine craftsmen en teach them the tricks of the craft. 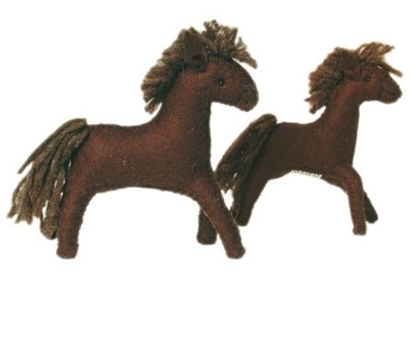 Dark brown horse made of pure wool felt, is also available in auburn and white color. To play farm or horse riding. Comes in two sizes, a smaller one and a larger one which allows to play mare and her filly. 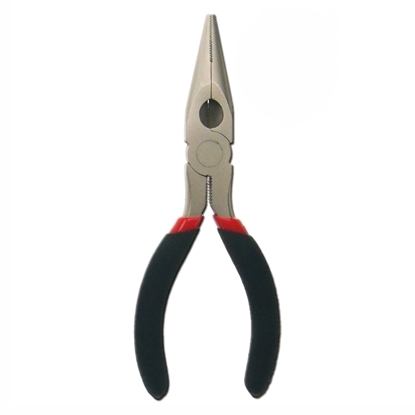 Small round pliers, especially suitable for bending wire. Solid quality. For specialized work made by little mechanics and artistic jewelery designers in short pants. 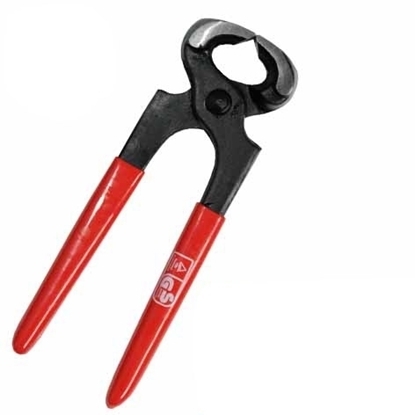 Small combination pliers, half round, long nose, very good quality, for advanced little mechanics and specialized mechanical builders in short pants. Pink velvet mantle with golden piping and golden crown design at the back, with which little girls can play queen, princes or fairy. One size. For little mechanics and mechanical builders in short pants, the multipurpose tool, to have always nearby! 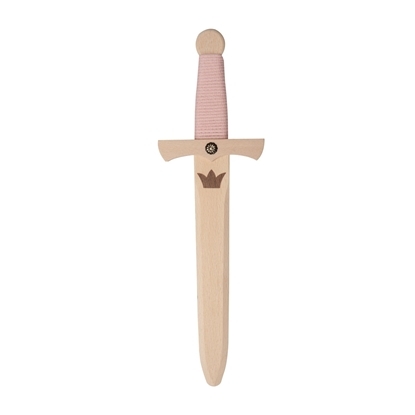 Pink wooden princess dagger, perfect outfit for little princesses. 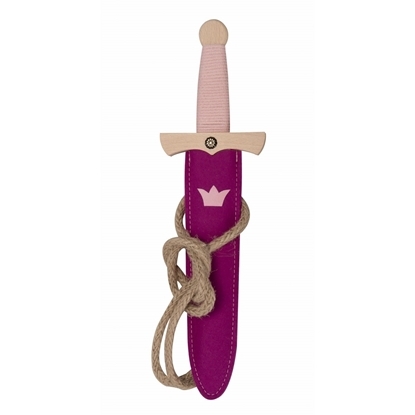 Pink wooden princess dagger, with pink scabbard made of wool felt, perfect outfit for little princesses. Little carpenters obviously need clamps to build everything! 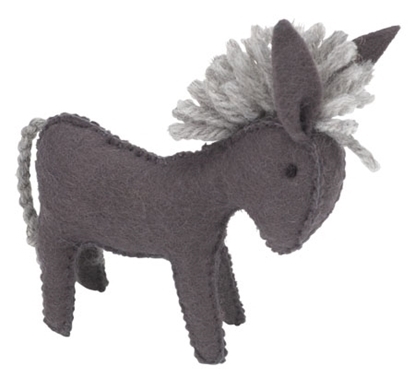 Little donkey made of pure wool, ideal for your child's play farm. 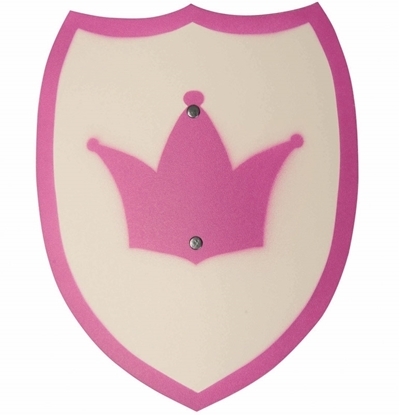 Pink and withe princess shield, decorated with a pink crown, made of plywood. Let's play princess or queen with the knights! 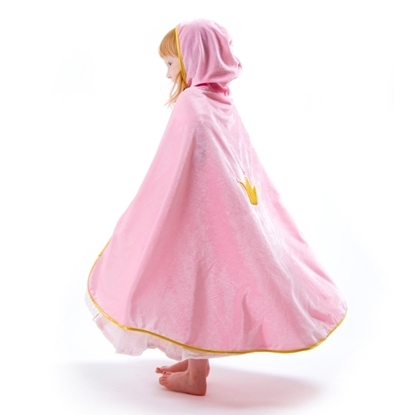 Princess cape in fuchsia pink wool felt and light pink tulle. Play queen, princess or fairy! Superstable clip, also suitable as a jigsaw clamp. This clip holds together what belongs together! For handy little tinkerers, practical to fasten something! 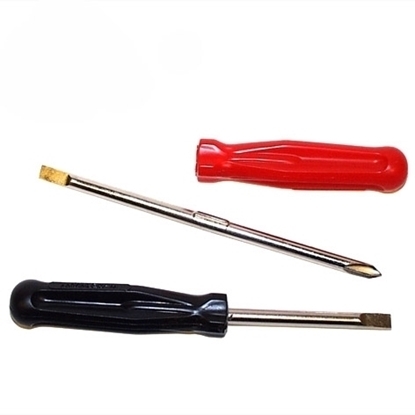 Reversible screwdriver: The metal insert can be pulled out and inserted in two ways: as a Phillips screwdriver and as a standard screwdriver. Top quality! .For the do-it-your-self enthusiast among our handy kids, always have this convenient tool with you! Pink princes hat or fairy hat in 100% wool felt with veil. 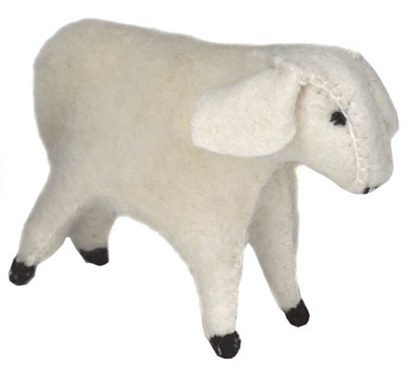 White sheep, made of pure wool felt, for the kids to play farm with natural materials. 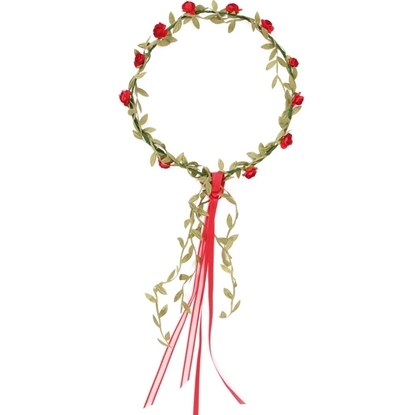 Red flower crown for little princesses, to play with the knights or to be the maid of honor.One size, adjustable. 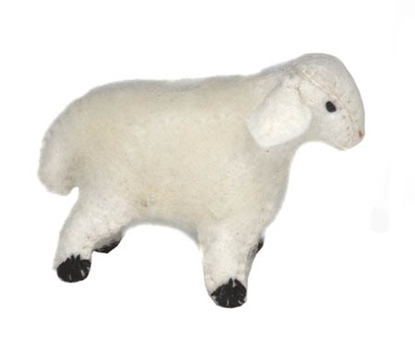 White lamb, made of pure wool, to play farm with the other farm animals in a natural and ecological surrounding. 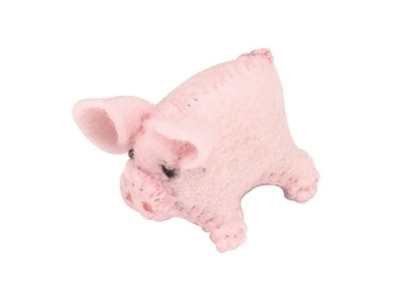 Baby pig made from pure wool for the play farm! 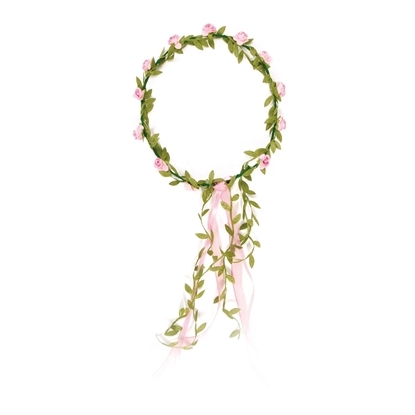 Pink flower crown for princesses to play princess or fairy or to be the maid of honor. 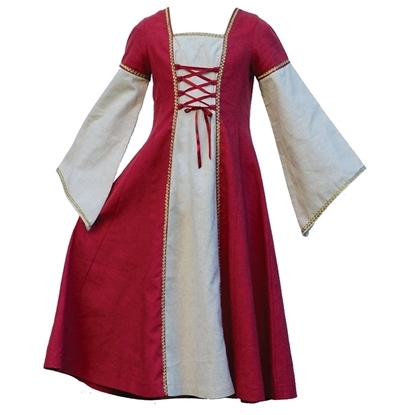 Red and white princess dress Little Marian, in 100% cotton, provided with a matching crown, comes in 2 sizes. Play the queen in the castle with the knights or play Robin Hood's beloved Maid Marian. 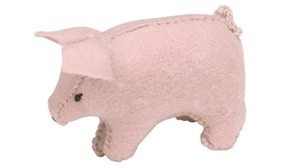 Large pig, made of wool felt, to play farm with the mother pig and the baby pig and with the other farm animals. 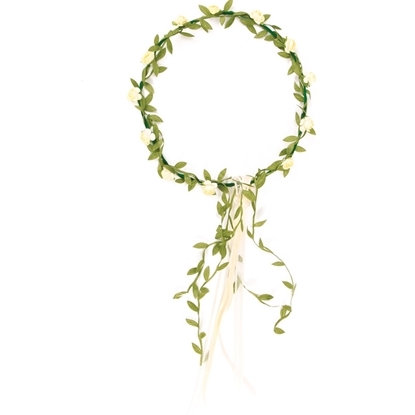 White flower crown for princesses, to play with the knights or to be the maid of honor. One size, adjustable. This cow is made of pure wool felt. The cow is an important element of the play farm. She gives us fresh milk every day and the farmer can also make cheese from this milk. A cow can't be missed in a playground and has its place between all play farm animals. Purple princess dress Eugénie, copies the style of the French Second Empire (19° century). The upper part of the dress and the sleeves are extensible, adding moving and play comfort for the little princesses. 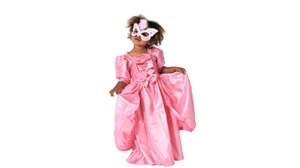 This princess dresses are suitable for role play, theater and dress up. Available in 2 sizes (from 4 until 9 years). Brown dog, made of pure wool, to play with the farm or as pet for your doll. 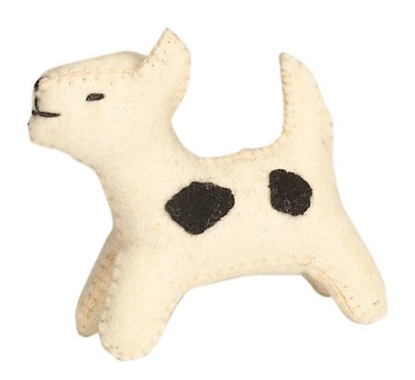 White and black dog, made of pure wool felt, to play farm or as pet for your doll. Pirate sling for kids to play pirates or other role plays. Made of wood and leather. Underskirt for children, gives the needed volume to a 18°century princess dress, very easy to put on and to wear. 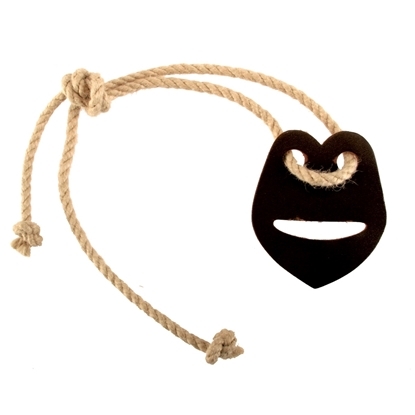 Pirate sabre or cutlass for children, made of wood, leather and felt. Dress up as a pirate! Pink princess dress Pompadour, copies the dress style of Louis XV period (18° century). The stomach part of the dress and the sleeves are extensible, adding moving and play comfort for the little princesses. 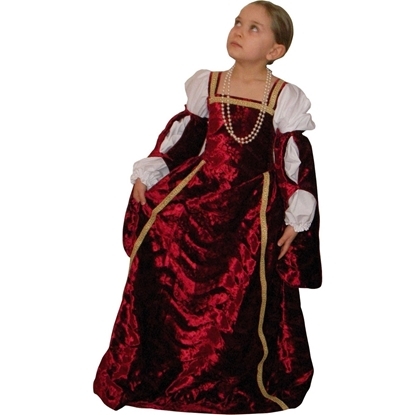 This princess dresses are suitable for role play, theater and dress up, available in 2 sizes (from 4 until 9 years). An under gown can be purchased separately if you want to give more volume to the dress skirt. 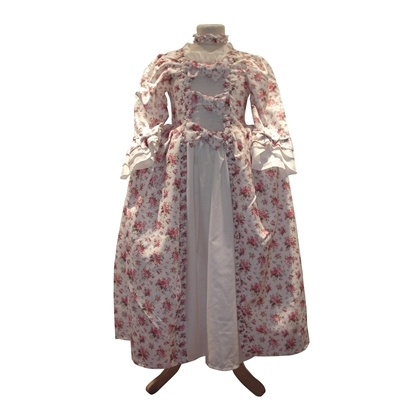 Princess dress Pompadour with red and cream floral print, copies the dress style of Louis XV period (18° century). The stomach part of the dress and the sleeves are extensible, adding moving and play comfort for the little princesses and makes them more suitable for different ages. Suitable for role play, theater and dress up, this princess dress is available in 2 sizes (from 4-6 and 7- 9 years) and comes with a hair/neck band with the same floral pattern. An under gown can be purchased separately if you want to give more volume to the dress skirt and have the real Pompadour look. 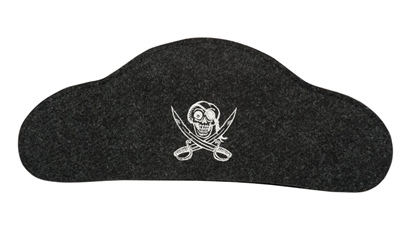 Black pirate hat for children, made of 100% wool felt, to dress up as a pirate. 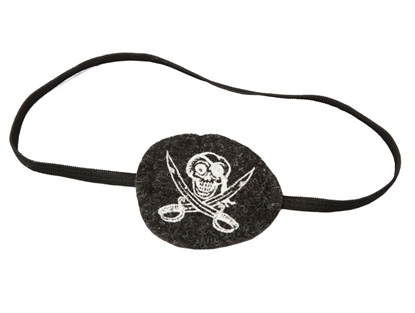 Black pirate eye patch for children, made of 100% wool felt and black elastic. Renaissance princess dress, copies the style of the renaissance in the beginning of the 16° century in France. 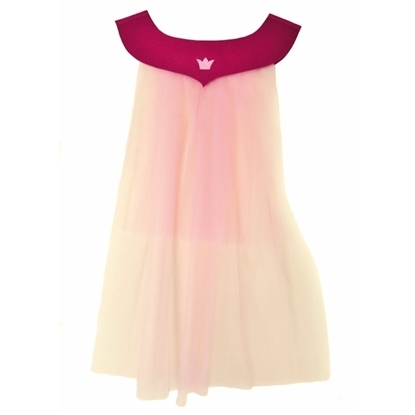 The upper part of the dress and the sleeves are extensible, adding moving and play comfort for the little princesses. 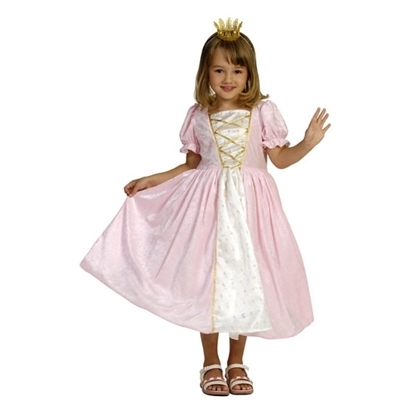 This princess dresses are suitable for role play, theater and dressing up. Available in 2 sizes (from 4 until 9 years). Pink velvet princess dress with tulle underskirt. The tulle skirt is decorated with sewn glitters, the top is made of velvet with smocking and puff sleeves. 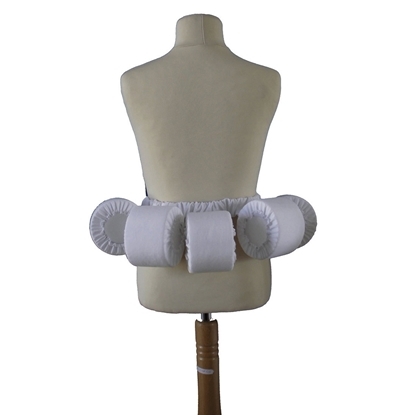 The elastic bust is perfect for moving and play comfort for the little princesses. 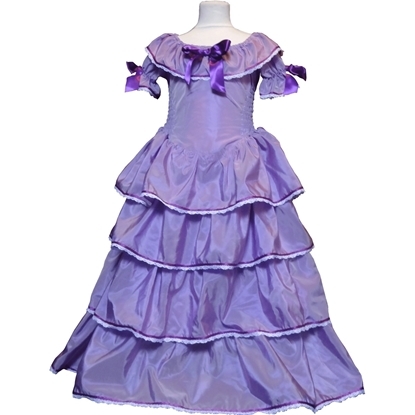 This princess dresses are suitable for role play, ballet, theater and dressing up. Available in 3 sizes (from 2 until 9 years). 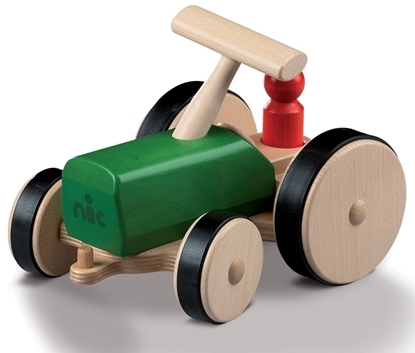 Wooden tractor for toddlers, equiped with a handy handle to drive it, provided with a figure. The tractor is equiped with a trailer hitch, to which several agricultural tools or carriages can be attached to perform divers farm tasks. 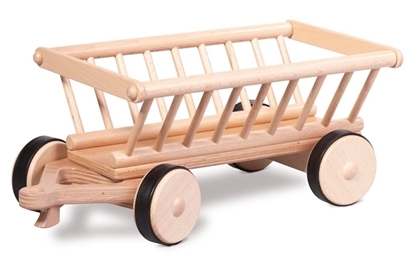 This wooden vehicles and accessories are robust, durable, well thought out, unequalled in quality, functionality and play value! Wooden loader, can be attached to the green tractor. 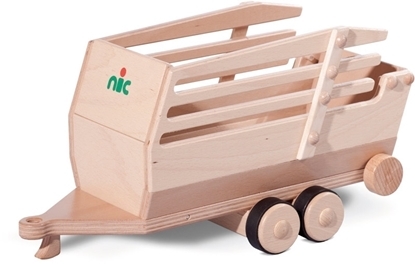 It is part of a set of wooden toy trucks, agricultural and other accessories which are interchangeable with each other. So you can start with one lorry or tractor and extend little by little your toy fleet for many years of endless play joy. Green twin-axle trailer to attach to the green tractor or to any other lorry. Extend little by little your fleet and have many years of endless play joy. 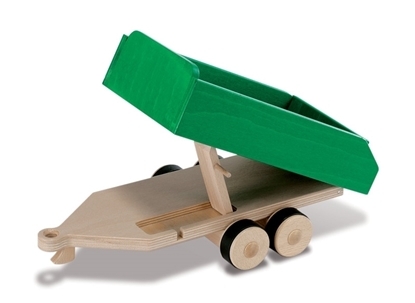 Wooden hay cart, can be attached to the green tractor, part of a set of wooden toy trucks, agricultural and other accessories which are interchangeable with each other. So you can start with one lorry or tractor and extend little by little your toy fleet for many years of endless play joy. Oil can for children. Grease your bike or your pedal car like a real mechanic or help Dad to do it. 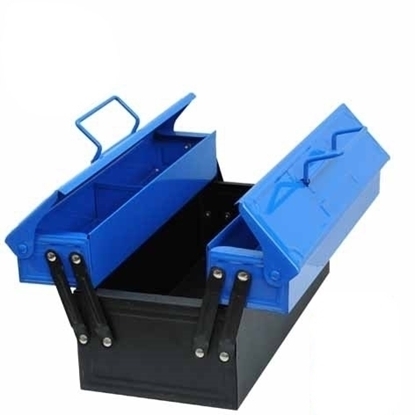 Blue metal toolbox for children. Functional and real. All the tools are neatly stored and ready to be carried to any place where work is needed. Like Dad's one! Delivered empty, without tools. Tractor with trailer in branch wood. 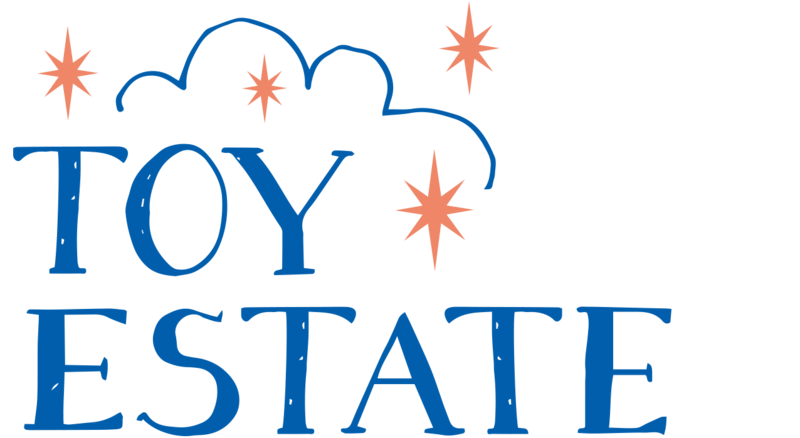 Branch wood toys forster kids to immerse in their fantasy. Branch wood still bears the shapes of nature and create an ideal surrounding to play with gnomes, fairies and farm animals. Assembled firmly and very stable to play with, the bark can’t come loose while playing. Fence in branch wood. 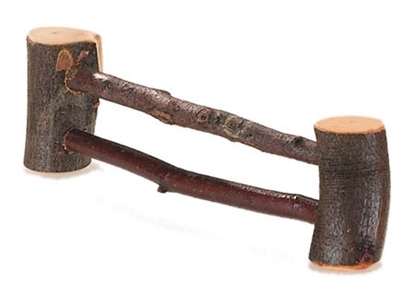 Branch wood toys help children to immerse more easily in their fantasy. Branch wood still bears the shapes of nature: an ideal surrounding to play with gnomes and animals. The toy is assembled firmly and very stable to play with. The bark can’t come loose while playing. 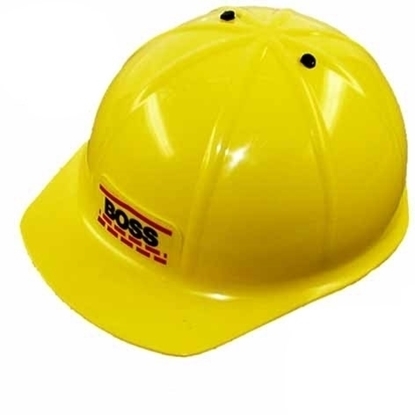 Yellow builder helmet for children, a toy construction helmet in very robust design. Although not approved as a work safety article but "only" as a toy, it prevents a lot. One adjustable size. Inscription on the front: BOSS. To play builder and to work like Dad. Water trough in branch wood. 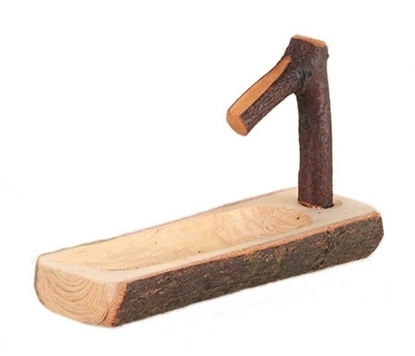 Branch wood toys help children to immerse more easily in their fantasy. Branch wood still bears the shapes of nature: an ideal surrounding to play with gnomes and animals. The toy is assembled firmly and very stable to play with. The bark can’t come loose while playing. Coloured rabbit hutch to put the rabbits in, on the play farm. Playing with natural and durable materials. 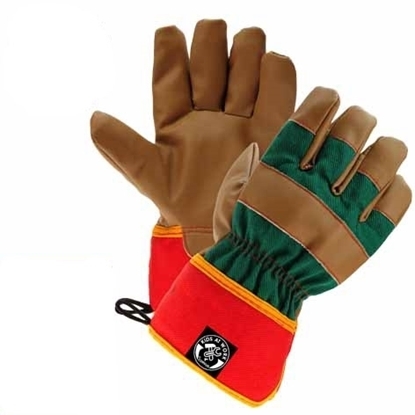 Work gloves in synthetic leather for kids made of fabric and PU, nice and soft, pliable, does not interfere with work, comes in 3 sizes. Work as a craftsman or help Dad. 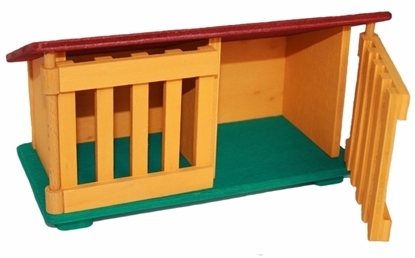 Wooden toy farm with 9 farm animals. The farm also has an enclosure with an arch that gives access to it. The farm building is accessible from the front and the rear. The farm is easy to build and store thanks to panels that fit easily into one another. 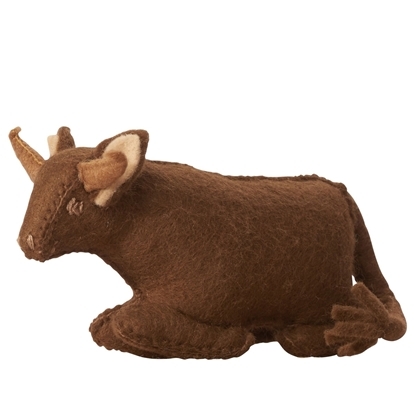 Our wool felt farm animals can also be used. 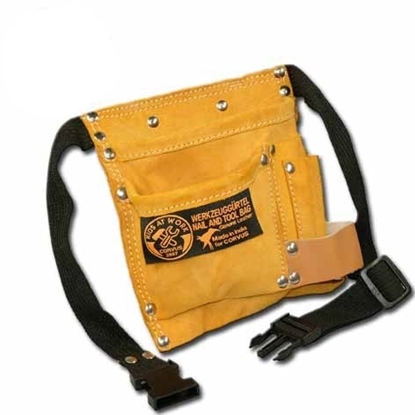 Single work glover for kids, made of leather and canvas and equipped with a metal carabiner to hang on your work belt and have it always within reach if needed while working. 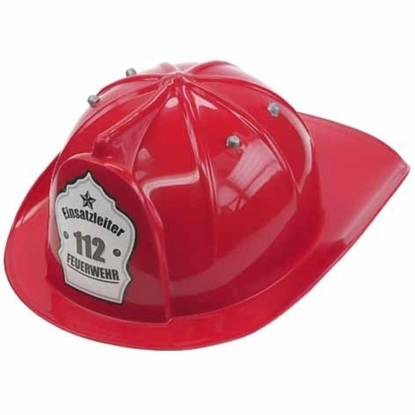 Red fireman helmet for children. A fire helmet that looks like one. Play helmet for the lifesaver, to play fireman and be very proud about ones heroic acts! Wooden knight sword with scabbard. 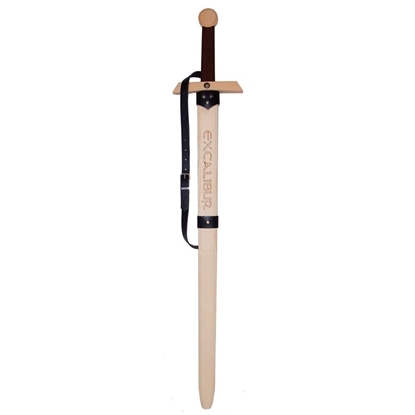 The sword's handle is wound by a dark brown strap to ensure a better grip. The light brown sheath is made of wool felt of and comes with a rope belt, to make wearing around the waist while playing possible. 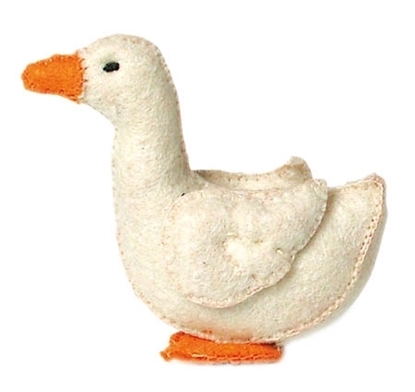 The use of wood and wool felt makes this toy a very durable and enjoyable one to play with. Playing to be a real knight, what a fun! Compact eco-responsible flashlight. Generate electricity and enjoy inexhaustible energy ... and fun! 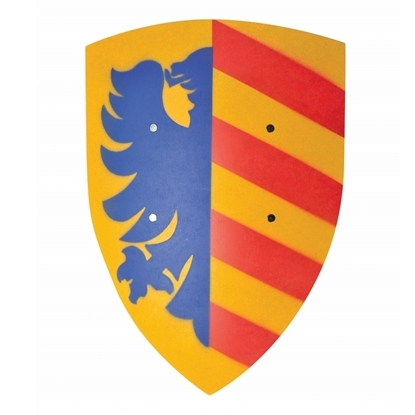 Wooden knight shield for kids with curved surface. Blue background with silver templar cross. At the back of the shield 2 leather straps allow to hold the shield tight. Full action with the fellow knights! 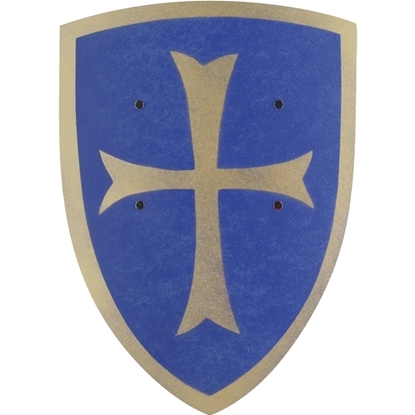 Small knight templar shield blue with golden cross for children to play with. This shield is made of wood. 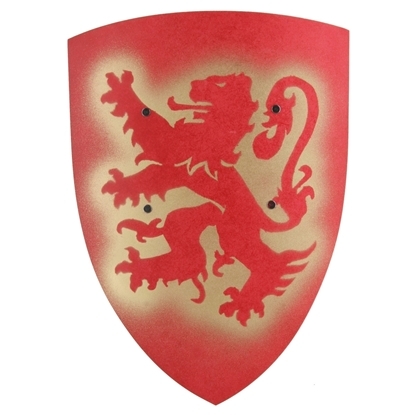 Wooden knight shield for kids with curved surface. The back ground is yellow. On one side is the half picture of an red eagle, on the other side 4 oblique blue stripes. 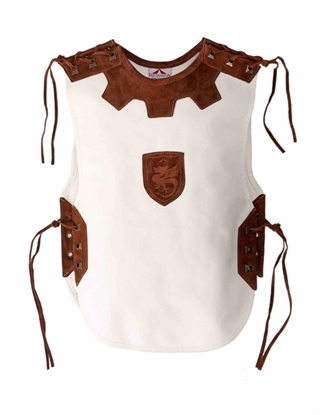 At the back of the shield 2 leather straps allow to hold the shield tight, in full action with the fellow kid knights. Wooden knight shield for kids with curved surface. The back ground is yellow. On one side is the half picture of an blue eagle, on the other side 4 oblique red stripes. At the back of the shield 2 leather straps allow to hold the shield tight, in full action with the fellow kid knights. Princess crown made of soft pink wool felt. One size, with stretcher at the back. 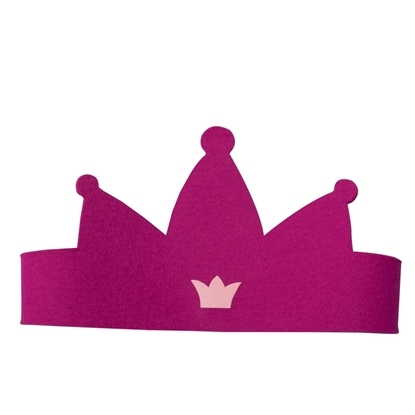 Little girls love to wear this soft and noble pink crown and feel themselves in the middle of pretend play with castle, knights, prince and king. 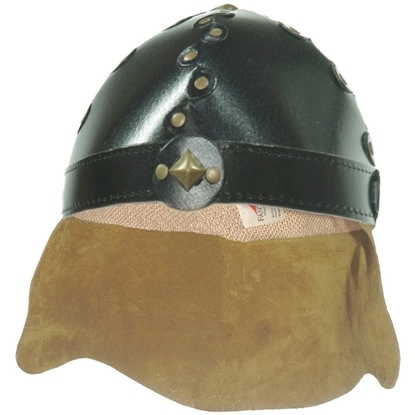 Black viking helmet with leather nose guard and cotton neck protection, made of cardboard with metal rivets. With this helmet on his head every child feels the bravery and courage and is ready pretend play numerous adventures. Wooden knight sword for kids, 50 cm long. The handle is painted in gold, the blade in silver. The sword's handle is wound by a white pure cotton strap to ensure a better grip. Let's pretend play with our fellow knights! Wooden knight dagger with his scabbard. 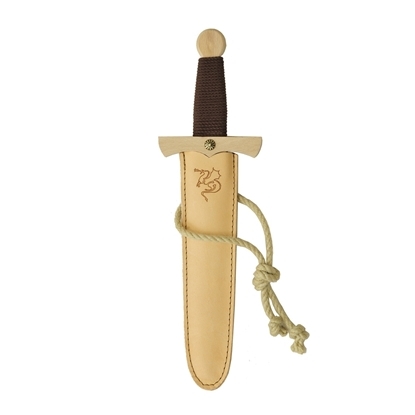 The dagger's handle is wound by a dark brown strap to ensure a better grip. The beige sheath is made of genuine leather of natural color and comes with a rope belt to make wearing around the waist while playing possible. 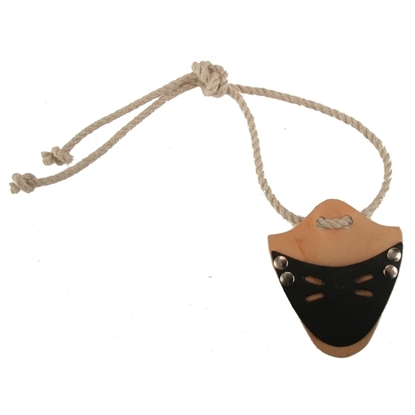 The use of wood and leather makes this toy a very durable and enjoyable one to play with. Playing to be a real knight, what a fun! 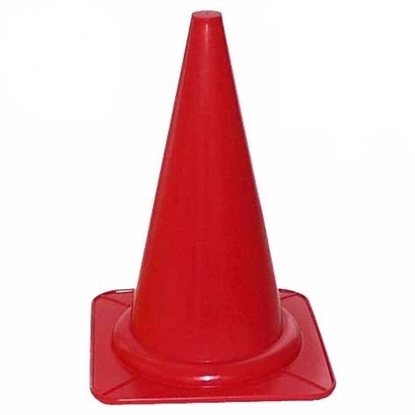 Red toy traffic cone for marking obstacle courses, slalomparcour, ball field, traffic training etc. Very solid execution. Drive around them with the bikes and the pedal cars, outside, and inside. Play big road or construction works with the friends or protect your play construction site! Knight dagger for kids, made of solid beech wood. Handle wounded by a dark brown strap to ensure a better grip and dragon drawing on the dagger's blade. Very durable and enjoyable to play with. Delightful to play knight with this toy! 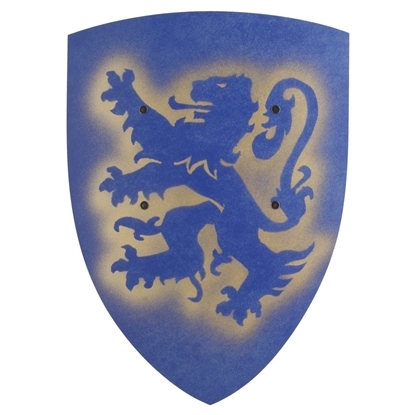 Big blue knight shield for kids, with lion. Made of plywood. At the back of the shield 2 leather straps to hold the shield tight. 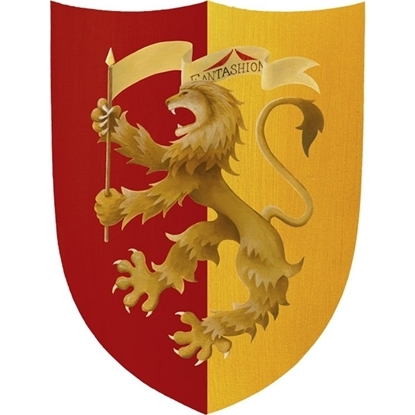 Big red knight shield for kids, with lion. Made of plywood. At the back of the shield 2 leather straps allow to hold the shield tight. 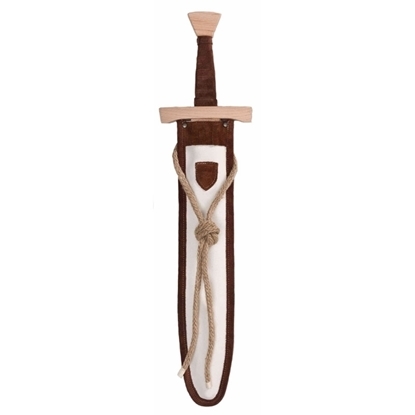 Leather sword belt for kids, made of genuine leather piece where to insert the play sword and a belt made of rope. Studded leather sword belt for kids, made of 2 pieces of leather in 2 different colors to insert the play sword in and a belt made of rope. 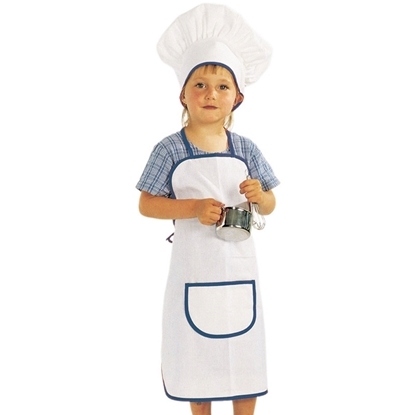 Cook's outfit consisting of a white and blue apron and toque in 100% cotton, be proud to be the cook in the play kitchen. 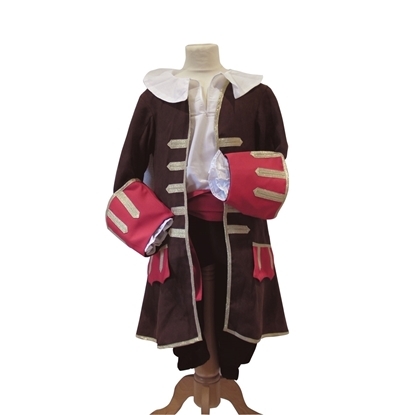 Give your child the feel of being a real pirate with this brown pirate frock coat and its wide red belt. Complete your outfit with a pirate saber, hat and eye patch. Can also be used as a nobleman disguise. For our brave little knights who are on the way to save the princesses from the dragon. Knight castle made of branch wood blocks. Build your mediaval castle as you wish and change the disposition as often as you want to make ever new castles. Wooden knight castle to play with knights and princesses. 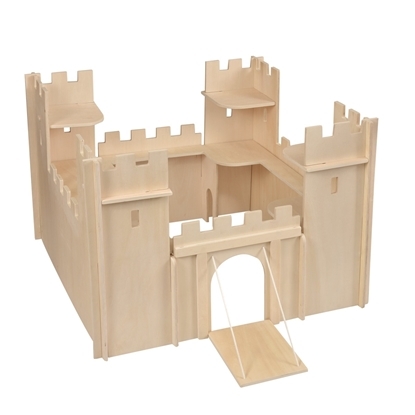 The castle is easy to build and can build up and can be stored flat. The castle has numerous places to place the knights: in the four towers to defend it, or behind the battlements. There is also a real drawbridge for many hours of play joy. Pirate spyglass for kids, good, functional telescope. Extendable. Scan the horizon in search of a ship to board! Come on, pirates, all to boarding!